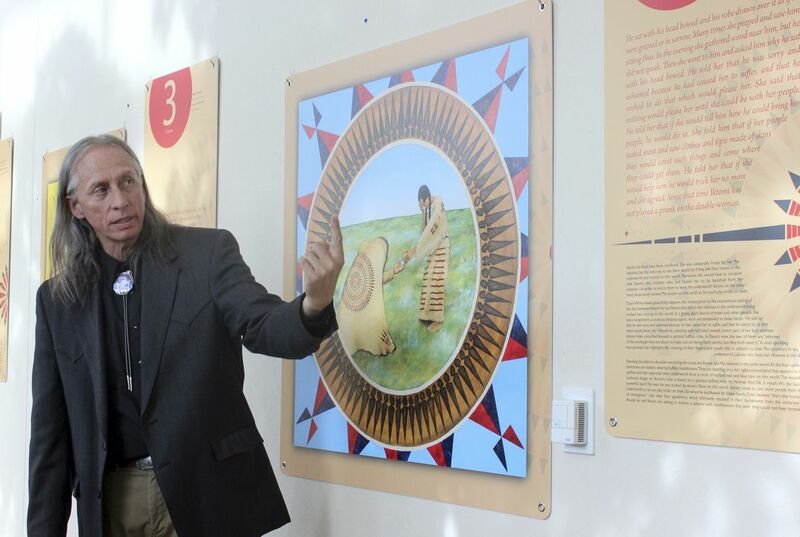 A traveling exhibit that pairs Native American art with passages of a traditional story narrating the emergence of the Lakota people in the Black Hills of South Dakota is on display in Sioux Falls. The exhibit, titled "Lakota Emergence," presents the traditional belief that the ancestors of the Lakota people emerged to this world through what is now known as Wind Cave National Park in southwest South Dakota. It divides the story into 16 passages, pairing each chapter with a piece created by a Lakota artist specifically for this project. "We do a lot of work trying to mitigate racism, and so, one idea was to do an exhibit not with that as its intention but with that as a possible outcome," said Craig Howe, executive director of the Center for American Indian Research and Native Studies. "The hope is that people are excited about this narrative. It shows a narrative that is linked to a particular place in our state, the Black Hills, and is a shared landscape. All of us know that landscape, Indians and non-Indians. The exhibit foregrounds that place." The Lakota are one of three divisions of Native Americans that the French referred to as the Sioux. The division involves seven tribal nations in the northern Great Plains. The 1,251-word narrative at the center of the exhibit was gathered by a physician serving the Pine Ridge area and published almost a century ago by the American Museum of Natural History. The story includes tales of deception, love, shame, misery and risks. Howe's organization, which is based on the Pine Ridge Indian Reservation, acknowledges that the narrative is one of only two stories out of the dozens gathered by the physician James Walker not attributed specifically to the spiritual leaders or others who shared information with him. But, Howe said, a careful reading of the narrative correlates with other Lakota stories, suggesting that the narrative originated with the Lakotas and was not made up by Walker. The traveling exhibit now on display at Avera Health's Prairie Center in Sioux Falls consists of panels that show true-to-size photos of the original exhibit, which debuted in Rapid City last year. The organization created it because the panels require far less care than the original collection that includes paintings, wood carving work, a glass mosaic and mixed media pieces. 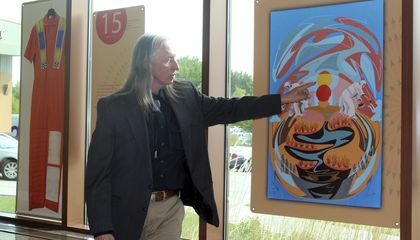 "We really were trying to get to this point where we could have two exhibits; a museum quality exhibit that can go to any museum in the United States or the world and a traveling version that can go to communities to get this in front of Lakota people," Howe said. "Most American Indians don't know this narrative. Most Lakotas don't know the narrative. They know a little bit about it, but here's a chance it can be educational for community people." Art can have a lot of different stories for a whole lot of different people. Art can mean something different to everyone. The way someone sees it may not be the same way another does. Everyone interprets art a different way, creating their own story to go along with it. Only the actual artist will know the exact point he/she was trying to convey. I think that's it is extraordinary that the Native Americans had writings to go with the paintings they made. The painting in the photo with the man, is absolutely gorgeous...it's so colorful and detailed! It's unfathomable to even think about someone sitting down and painting that! Art has the power to speak to various people in many different ways, it has the ability to unite individuals while they forget about their differences and focus on the beauty in front of them. By addressing racism through art, more people could possibly see equality through the artwork. A traveling exhibit, "Lakota Emergence," pairs Native American art with passages of a traditional story telling about the emergence of the Lakota people in the Black Hills of South Dakota is on display at Sioux Falls. It presents the belief that the ancestors of the Lakota people emerged to this world through what is now known as Wind Cave National Park in South Dakota. Art can reduce racism because it can make people respect other races. People judge other races by the way they talk or their arts and traditions but art can change that because people tell their stories through their arts..
Art conveys feelings, ideas, and different perspective on things many people aren't familiar with. Art can reduce racism by showing people more about someone and how they feel and think. Art can help reduce racism by showing different cultures and how we live the same but different lives.